I like one bowl meals, especially when cooking solo. 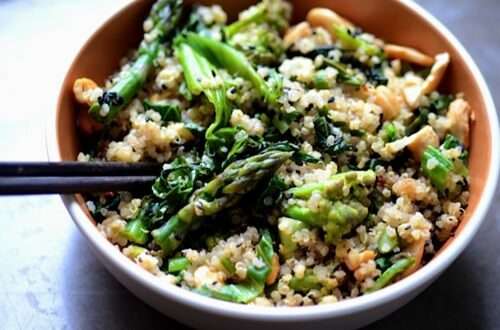 When I cook for myself I take a clean out the fridge kind of approach, the other day I had some leftover quinoa and way too much asparagus so I put it all together, added some asian inspired seasonings and lunch was served. 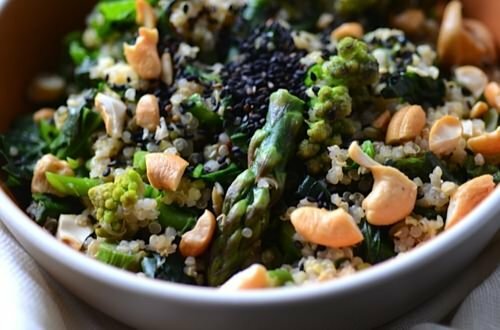 This recipe is super flexible, you can mix up the flavorings and veggies to suit your taste. 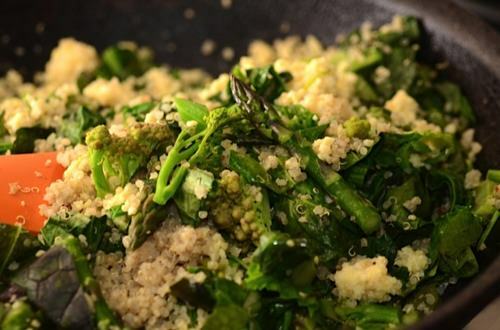 Lately, I’ve been trying to make a big batch of quinoa at the beginning of the week, make a stir fry like this one and then I’ll make quinoa patties with the leftovers. This time of year, the garden is just starting to deliver little treasures like this romesco that I picked right before lunch. I love it’s exotic alien look and it’s delicious roasted. 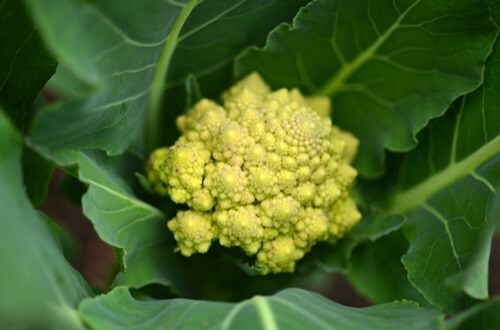 The beauty of growing your own vegetables is that you can try unusual varieties that go way beyond what you would normally find in your local market. I started by sauteing some garlic and ginger, threw in some mustard greens, the romesco and asparagus and let them cook for a few minutes. I added the quinoa, seasoned it up with soy sauce and sesame oil and then finished it off with some roasted cashews and black sesame seeds. Vegan, healthy, quick and just about the perfect lunch! Heat olive oil over medium heat until hot but not smoking, add garlic and ginger and stir for a minute until fragrant. 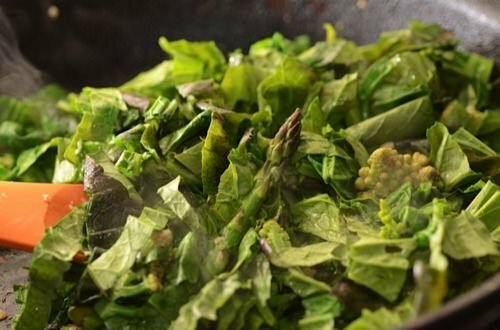 Add asparagus and romesco and cook for a few minutes, then add the greens and a pinch of salt, cover and cook for 2-3 minutes more until greens have wilted. 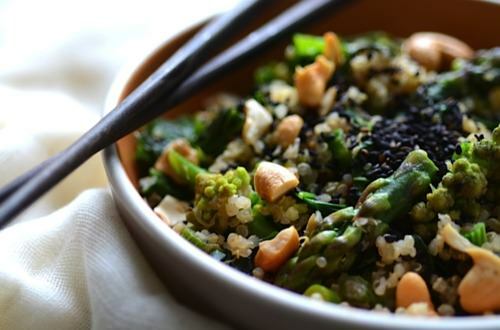 In a small bowl combine soy sauce, sesame oil and chili paste then add to the pan with the quinoa. Cook until everything is heated through. Take a taste and if desired add a little more soy sauce or sesame oil it should be pronounced but not overpowering. 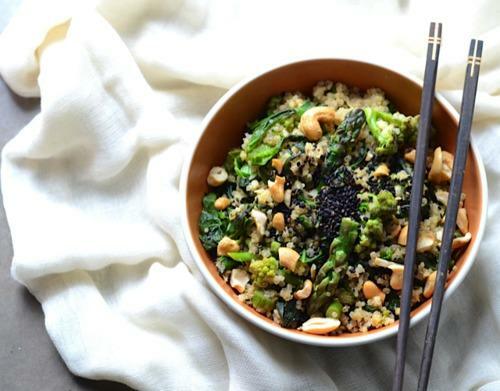 To serve top with the cashews and sesame seeds. To cook quinoa: Combine 2 cups of well rinsed dried quinoa with 3 cups of water and 1/2 teaspoon salt in a medium saucepan. Bring to a boil, cover, reduce the heat to low and simmer for 15-20 minutes until quinoa is tender.